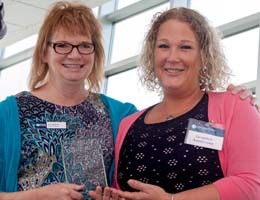 The Tidewater Community College Women’s Center educates, empowers, enhances and engages women so they can be successful. 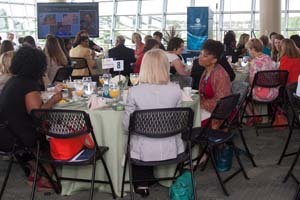 Community leaders and business partners celebrated the work being accomplished during the 13th annual Women’s Leadership Breakfast. TCC Alumni Board member Tracy Keller, chief executive officer, Girl Scout Council of Colonial Coast (GSCCC), shared her story of success. 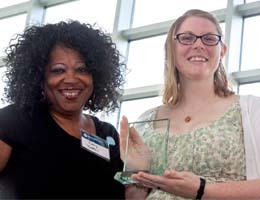 Keller, who holds three associate degrees from TCC and a bachelor’s from Virginia Wesleyan College, got her start with the college as a dual enrollment high school student at the Virginia Beach Campus. Keller returned to TCC to enhance her skills after a broken relationship and bankrupt business led her to find a new career path. She began her work at GSCCC as a data entry specialist, and with hard work, determination, and education, moved up the ranks quickly. “I loved the small class sizes at TCC and was amazed at the compassion of my math teachers,” she said. “When one of my TCC professors told me I was capable, that was my turning point. She showed me the whole point of math and empowered me. 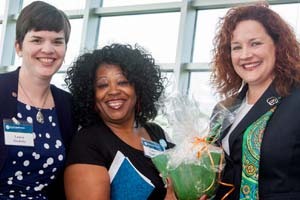 The event recognized three students with special awards. Jacqulyn Armstrong was given the Mary Pat Liggio Student Leadership Award, named for the founding coordinator of the Women’s Center. Armstrong is pursuing an Associate of Applied Science in Human Services and holds a 3.6 GPA. She is a graduate of the Women Inspiring Self-Empowerment (W.I.S.E.) Leadership Development Program, a member of Phi Theta Kappa and president of the human services club on the Portsmouth Campus. “As a single mom, I needed a lot of assistance,” she said. “Now I want to be part of the solution and give back.” Armstrong hopes to continue her studies at Old Dominion University and ultimately work in community outreach or as a grant writer for a nonprofit agency. Anastasia Muir and Kakan Roy were named the Dr. Alexsandria Manrov STEM Award winners. Muir is pursuing an engineering degree and hopes to become an electrical engineer. Roy is majoring in science and hopes to become a physician. During the 2014-2015 school year, over 10,000 students at TCC participated in programs or received services from the Women’s Center. The Women’s Center provided, often collaborating with campus and community partners, over 148 programs, on topics ranging from leadership and professionalism to personal safety and healthy relationships. In addition, 65 students received over $9,000 in emergency assistance funds that were determined by Women’s Center staff to be critical to the retention of these students. To address hunger on campus, the center also provided $850 for students to put on their student ID cards to access dining resources in campus cafes. The event was funded by presenting sponsor Dominion Virginia Power. Other sponsors were Farm Fresh Supermarkets; TowneBank; Pender and Coward; Dollar Tree, Inc.; Top Guard Security; NOAH Enterprises, Inc.; Wilbanks, Smith and Thomas; Monarch Bank and Mortgage; Prevailance, Inc.; and Booz Allen Hamilton.